These beautiful original design ball markers are created by Helen H. Thomas. 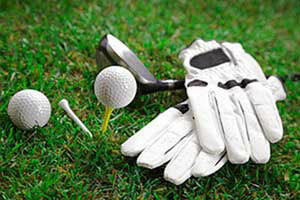 Be the talk of the golf course with our Beautify Your Game™ golf ball markers. Choose between our regular ball markers or the Swarovski crystal versions. 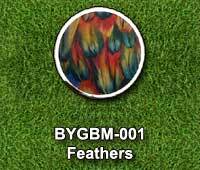 Feathers - 27.4mm ball marker with feather design in red, yellow and blue colour scheme. 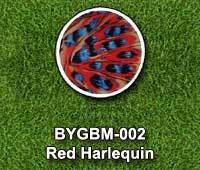 Red Harliquin - 27.4mm golf ball marker with feather design in red, blue, black and yellow colour scheme. 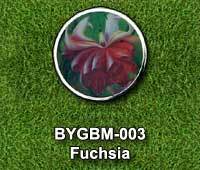 Fuchsia - 27.4mm ball marker with a fushia. 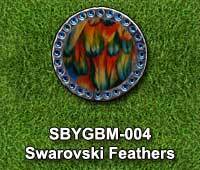 Swarovski Feathers - Our Feathers golf ball marker with blue Swarvoski crystals around the perimeter. 33mm diameter. 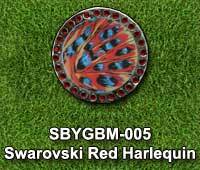 Swarovski Red Harlequin - The Red Harlequin ball marker surrounded with blue Swarvoski crystals. 33mm diameter. Swarovski Fuchsia - Our Fuschia golf ball marker surrounded with a circle of red Swarvoski crystals. 33mm diameter. Swarovski Crystal Feathers ball marker. Swarovski Crystal Red Harlequin ball marker. Swarovski Crystal Fuchia ball marker. We have horse racing themed golf ball markers by this same artist. 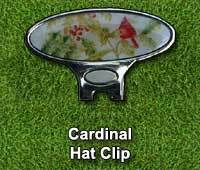 Hat clip metal type is matched to the ball marker. 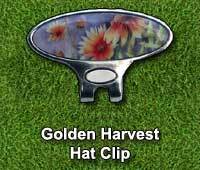 Golden Harvest magnetic hat clip. Original designs by Helen H. Thomas. High-quality Swarovski crystals used for our Swarovski versions of these Beautify Your Game™ ball markers.